The saltwater in my veins always draws me to nautical decor. 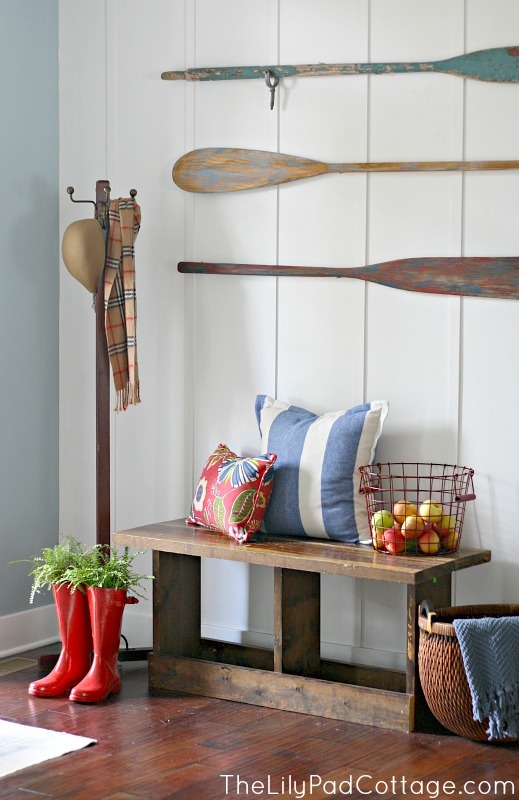 I'm especially loving the use of vintage oars in home decor right now and.... I found a pair at a flea market recently. They are from the New England area and have perfectly weathered blue paint on them. Kelly, from The Lily Pad Cottage, has a fabulous entryway in her lake home in Michigan using vintage oars as a statement piece on her wall. Source - The Lily Pad Cottage Her entire home is fabulous and so is her blog. You'll want to take your summer vacation there. Anyways, I'll quit dreaming about her home and get back to nautical decor. That pair of blue oars was my inspiration for the theme of my window booth. "Patriotic Nautical Summer" While I was planning what items to take, I remembered I had a thrift store paddle tucked away that needed a makeover and it would go great with the theme in my booth. I sanded the paddle, painted it white, taped off a few stripes on it and cut a number five from my Silhouette Cameo out of sticky vinyl to use as a template. Then I painted it red, waited for it to dry and peeled off the tape and the vinyl #5. I distressed it and hand rubbed an antiquing finish on it. Here it is in my booth. This is all making me want to get to the beach. 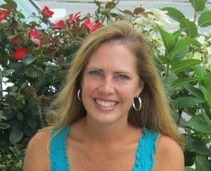 I love summer, the warmer temps, the ocean and I especially love the red, white and blue! Here is an outside view looking into my window booth. 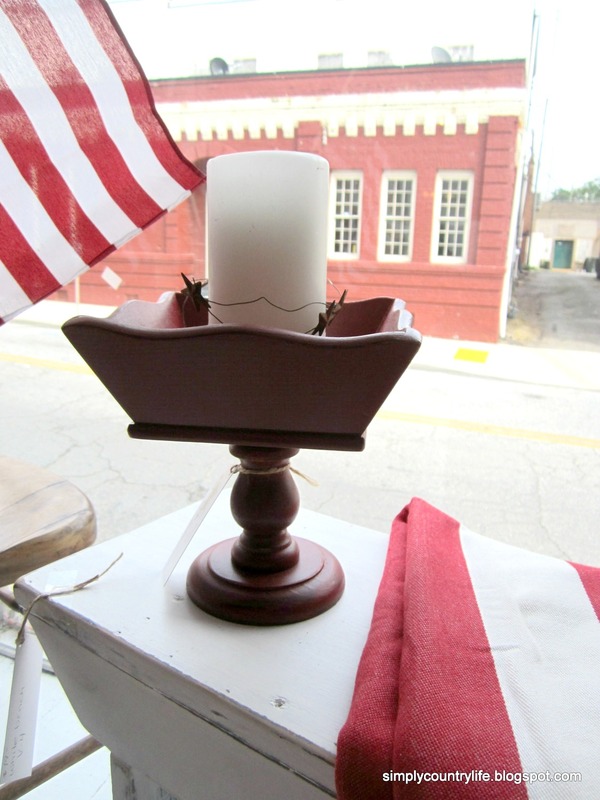 The red pedestal bowls in the window were thrift store makeovers too. I worked on them while I was painting the #5 paddle. and attached the bowl portion to a candle holder. Both pedestals were sanded, painted, distressed and oiled with a protective finish. I added a white pillar candle and rusty star garland to the square one. or are you more of a cooler temp, woodsy, mountain kindof person? Either way, I hope you enjoy your summer! How cute! That oar came out great - and you know me, I like my red :-) of course, I am loving the bowl/stand you made too! Your booth is so pretty. Wish I was closer. Yes, I am hoping to get to the beach this Summer...maybe even a weekend stay at one..even though I can easily make a day trip..nothing wrong with that right? You know, red is my color. Definitely, a beach trip for a few hours is a blessing :-) How fun, I love Charleston! Happy Birthday & Happy Anniversary ( early)!!!! !